Weathered Wood Address Plaque - - personalized carved pine wood sign features an aged-antique (weathered) finish. The sign has the appearance of an old rustic weathered patina. Wall mount. Custom made in the USA. 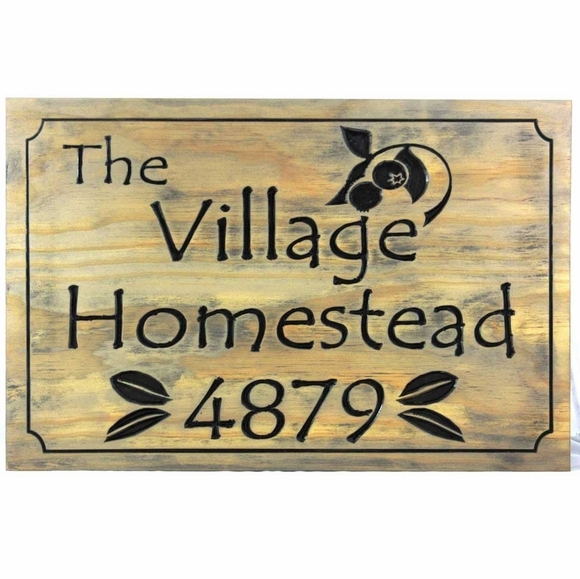 As shown in the sample above, this rustic sign with a blueberry motif is perfect for a business, home, or property with a two-word name, for example, Comfort House, Hilltop Retreat, Johnson Castle, Camp Blueberry, Patty's Fruit Pies. Cabin sign personalized with the property name and street number and the edge style you select. Great for a hunting lodge, mountain home, country retreat, camp, or cabin. Two sizes: 22"W x 14"H x 3/4" and 26"W x 16"H x 3/4". The word "The" at the top is optional. Line 1 holds up to 9 characters. Address line at the bottom holds up to 5 characters. Color: grayish weathered white wash finish with black lettering.